Lattice Quantum Chromodynamics, or Lattice QCD, relies on high-performance computing and advanced software to provide precision calculations of the properties of particles that contain quarks and gluons. 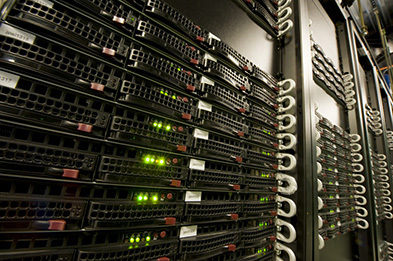 Fermilab is home to one of the US LQCD collaboration’s high-performance computing sites, which uses advanced hardware architectures. Quantum chromodynamics is the study of how quarks and gluons interact through the strong force. This requires the study of interactions at distances smaller than the diameter of a proton, about 10-15 meters across. Experimental physicists do not observe quarks in isolation in their detectors but instead bound together to form particles such as protons, kaons and pions. Predicting the properties of these particles requires Lattice QCD. In Lattice QCD computations, physicists replace continuous space-time with a four-dimensional lattice that represents the three dimensions of space plus a dimension of time. The space-time box is made big enough for a proton to fit inside. Physicists use Lattice QCD to make predictions of masses and decay rates. They then compare those predictions to measurements from experiments. Physicists look carefully for any inconsistencies between experiment and theoretical predictions. Such inconsistencies might be an exciting hint of new physics beyond the Standard Model. Fermilab currently operates five LQCD clusters. We have three conventional Infiniband clusters based on multicore CPU processors and another two Infiniband clusters that use GPU-accelerators.